Stand out from the crowd with this gorgeous handmade multicoloured rainbow drops dog dickie bow and brighten up your walk in the park! 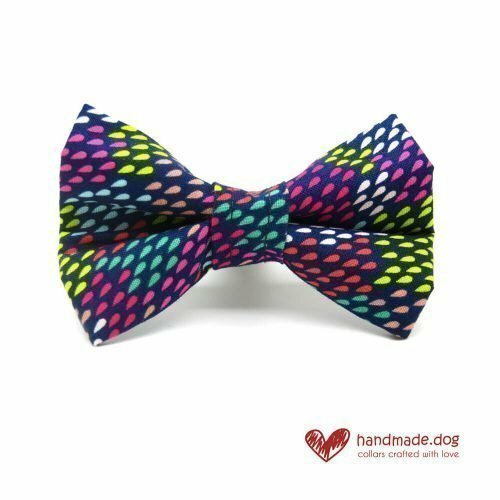 This lovely handmade multicoloured rainbow drops dog dickie bow is made using a cotton fabric for a quality finish. 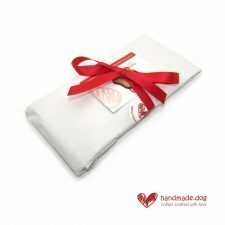 Our fabric dickie bows are lovingly handmade and feature an elastic loop that your dog’s collar slips through. This ensures a simple and secure way for your pooch to proudly wear their dickie bow. Position the dickie bow to the front, side or rear of the collar for your preferred look. Check our sizing guide and aftercare guide for further details. 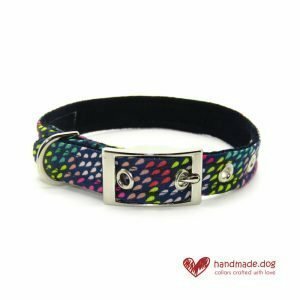 A matching handmade multicoloured rainbow drops dog collar, lead and bandana are also available to make your dog even more dapper! What dickie bow size do you need? 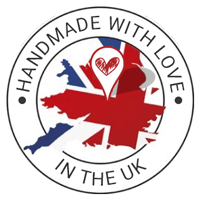 The Small dickie bow is designed to work for the 16mm and 20mm wide collar, measures approx 2.5 Inches x 2 Inches and is suitable for small breeds such as Bichon Frise’, Jack Russell Terrier etc. 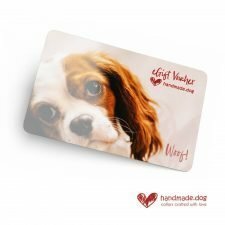 The Medium dickie bow will work for both the 20mm and 25mm wide collar, measures approx 3.5 Inches x 2.5 inches and is suitable for small and medium sized dogs such as Cocker Spaniel, Frenchie, Cockerpoo etc. 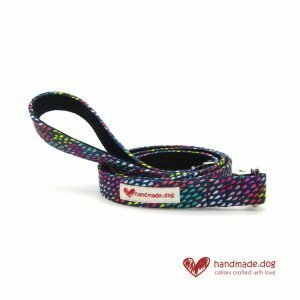 The Large dickie bow is designed for both the 20mm and 25mm wide collars, measures approx 4.5 Inches x 3 inches and is suitable for larger dogs such as Labrador, Old English Sheepdog, German Shepherd etc. Our dog dickie bows are sprayed with a high quality fabric protector to help repel any dirt. 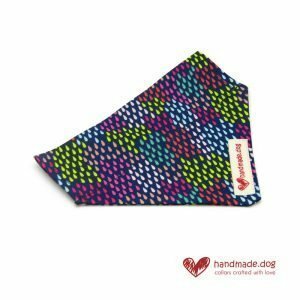 However, should your pooch get mucky, their dickie bow can be machine washed at 30 degrees, left to air dry and ironed (if necessary) to bring them back to perfect condition.